You never really know what life has in store for you until it's staring you right in the face. 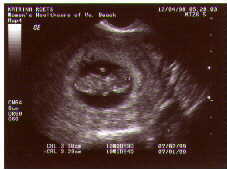 In October of 1999, after over 2 years of trying, I discovered that I was pregnant. As any mom out there can tell you, I was beyond excited. I was only 23 and never expected any sort of complication. Nobody did. We were all surprised and devastated when I went into early labor at only 16 weeks pregnant. By the time I convinced my doctor's office to see me (they thought I was being paranoid), I was already over 3 cm dialated. By early the next morning, my water had broke and they'd induced the labor that had just as suddenly stopped. What they discovered is that I have an incompetent cervix. It can't handle the weight of a pregnancy like a normal one would. What I also wasn't expecting was my own reaction to the loss of this precious child. I don't know if I considered myself a strong person before this but I know that losing that baby brought me to my knees. Sadly, in some ways, I think this was the beginning of the end of my marriage. We stayed married another 7 years but the truth is that our different reactions to the loss of this child drove a wedge between us. While I desperately needed to talk about what had happened and the horrible heartbreak and pain I felt, he locked it away and acted as if it never happened. Once his week off of work was done, he went back to the office and ignored the fact that he was leaving a devastated wife who was still deeply in mourning at home. He expected me to just act as if it had never happened, to take down the nursery by myself and to go back to being this happy, carefree girl. I don't know if he ever understood that I wasn't that girl anymore. I was a woman who had gone through one of the hardest things a person had ever gone through. Because he didn't deal with his own feelings, he became cruel to me at home. He would never come out and tell me that he blamed me for what had happened but his actions quite often spoke louder than his words. Sadly, his words weren't always very pleasant either. It was an incredibly difficult time for me and it's only now, 11 years later, that I can look back on that time without wanting to curl up into a tiny ball. Peter and I are both in better places now and we were blessed to go on to have 2 more children over the next 2 years. Those two boys are the brightest spots in my life. I know that if we hadn't had lost Austin, one or both of those boys wouldn't be here today. That doesn't make me thankful for what we went through, but it did make me realize just how fragile life is and makes me cherish every moment I have with my boys. Today, if he had somehow survived, my little boy would have been 11 years old. I wonder what he would have been like, what his personality would have been. I know that he would have been beautiful because both of my boys are and even his tiny body, weighing less than a candy bar, was perfect. More than anything, I want him to know that I loved him with everything I had. I think he does because I have never forgotten him and I never will. I know that he's out there, watching over his brothers and me. I'm so sorry for your loss. The loss of a baby during pregnancy is so hard. You never stop wondering what they would have been like. What a tragic episode in your life. I am so sorry. Sometimes "what ifs" can be so painful and yet--how can you but wonder. Sending you hugs. Such a powerful post. I am so sorry for this difficult event in your life. ((HUGS)) Katie! What a powerful story! Thank you so much for sharing it with us!